If you are someone who cares about money, you are likely to have many financial advisors in your life. Being broke is easy, but building wealth and security takes effort. A good advisor will provide guidance and perspective, alerting you to financial realities you may not find out about on your own. A good advisor can work like a coach, a counselor, or a manager. The best are some combination of the three, though they will vary according to your needs. If you are looking for your first real financial advisor, or if you are seeking a new one, here are 5 things to look for. Do You or Your Firm Sell Financial Products? First of all, check if there is a planning fee for meeting with your prospective advisor. Also, find out if he or she is in the business of selling financial products. You don’t want to deal with someone if they are in the business of anything but giving you good counsel. A Personal Financial Specialist is an example of someone who can act as comprehensive advisor to someone getting their start in focused personal finance. For those with higher income, Certified Public Accountants can be a good choice, though there are others available. What Kind of Clients do You Serve? What Kind of Services do You Provide? An advisor that works as an investment consultant is not going to offer you the same services as someone who offers comprehensive financial services. Mattioli Woods might offer a lot to someone with a sophisticated financial life, but be ill-fit for someone just making their start. 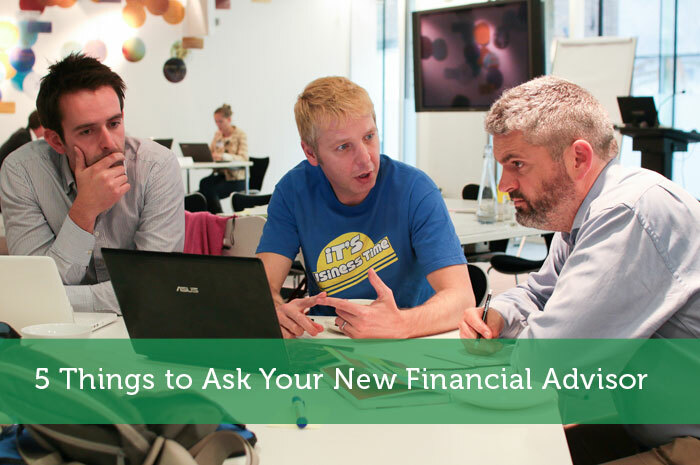 Have a firm understanding of your means and goals before approaching financial advisors. What Does Your Typical Financial Plan Look Like? When you see an example of an advisor’s real financial planning, you’ll know how he or she is likely to approach your financial situation. Would you be happy with the work, as demonstrated? What is Your Investment Advising Style? There are many different approaches to investment management. Some advisors and managers will work to make their clients a lot of money, through frequent and risk-prone investments. Others will only work with slow-growing, dependable low-cost funds. Understand your own preference, and make sure you are selecting an advisor in keeping with these. How Much Attention Will You Be Giving Me? What is your prospective advisor’s client load? In choosing him or her as your advisor, will you be meeting primarily with this advisor or with others on an advisement team? How much understanding and sophistication are you, the advisee, expected to bring to the table? Make sure you feel very comfortable with the situation before signing up. A good financial advisor can be a wonderful professional relationship that lasts for years. But make sure you pick the right one. By choosing the best advisor off the bat, your wealth will have more time and insight with which to grow. There are many other things you’ll probably want to ask your potential advisors, but these are things you should ask every prospect. Great questions to ask a financial adviser. Always get a good understanding of how they handle their clients before signing on. It is important to choose a financial advisor who will work for your best interest. Question no. 1 is very important in ensuring that you are dealing with a financial advisor who can give you genuine advises with no strings attached. Great advice! It is very important to choose the right financial advisor. Financial advisors have their own expertise and it’s useless to work with an advisor who cannot address your goals and needs. I’m struggling with my finances, so I could use a financial adviser to help me sort out my financial plan. It helps to have a few tips to improve my finances. I agree, it seems important to ask a financial adviser about the amount of time they’ll be able to give you. Having as much one on one attention from an adviser is necessary in order to help you develop a good financial plan. This is great advice, I haven’t had a financial planner or advisor yet, but I’m planning to in the near future since I started a new job that pays much better than my previous one. This article raised some points I didn’t think about, like asking how much time they’ll devote to me or what a typical financial plan for them is like. I’ll be keeping this in mind when I call around, thanks so much! I like the idea of them providing a sample of their work. You would want sample work from the contractor doing your kitchen so why not of your financial advisor. Finding the best fit for you is just as important as finding the best advisor. These are some great ideas, especially number 5. You’ve got to establish clear expectations with any kind of professional you’re working with, and a financial advisor is no different. It’s definitely important to know if you’re expected to have a lot of knowledge and insight, especially if you’re just starting out. You want someone who understands your situation and can really help you along your financial journey. Thank you very much for all this advice. I’m looking to hire a financial advisor, and I want to be sure that I choose the right one. I’ve never hired one before, so I wasn’t sure what kinds of questions to ask. Thankfully, I came across your article, and the list of questions that you provided were very helpful. Thanks for the tips about making sure your financial planner has plenty of one-on-one time to spend with each client. It really makes a huge difference. My friend just hired a guy who goes out of his way to make sure they’re updated monthly on what’s going on with their account. They have plenty of peace of mind knowing that their money’s not just rotting somewhere. It’s great for business and it’s great for clients. Thanks for sharing! I think that number two here is really important to know right off the bat. My father is a financial advisor and I always go to him first when I need advice or help. I will be sure though to follow this advice in the future and even see what he thinks about this and other articles that I have been researching. Thank you for the information here. I will be meeting with a financial planner this week. I agree that it is a good idea to ask what kind of clients they serve. This will help me gauge how they will be able to help my and my needs. Thank you for the information. I really appreciate these ideas because I am looking for a good financial advisor for the first time. I had not realized that there are different advising styles, like you discussed. How can I determine what style would be best for me? Thank you for advising your readers who are interested in hiring a financial adviser to be adamant in asking how much time and service they will actually receive. I recently had an adviser that would never answer my calls and wouldn’t get back to me until my problems had been solved. Just make sure you know what you are getting before hiring anyone. I want to make sure that I get my finances figured out. It makes sense that I would want to hire a financial advisor! I’ll make sure that I find one that offers an impressive financial plan.